Apartment of 40. 6 sqm, located on the first floor of the Casale, and elegantly furnished in Tuscan style, modern and comfortable. The atmosphere is highlighted by terracotta floors and beamed ceilings. It consists of a living room with a double sofa bed, a fully equipped kitchenette with induction hob, fridge, microwave oven, American coffee machine, toaster; dining area with table and six chairs 22 '' flat-screen satellite TV; double bedroom with double bed and two closets with two doors; bathroom with sink, bidet, shower / WC. Conditioned air. Gazebo reserved on the ground floor. Pool (14 x 7 meters) outdoor in common with other guests of the property. Private shaded parking and an automatic lock. Enclosed garden. 3 Grill at the open. It is located in the floor, 4 km below Riparbella. Because of our convenient location, the ideal starting point for excursions to Volterra, Bolgheri, San Gimignano, Pisa, Lucca and Florence, as well as the Tuscan Coast "Costa degli Etruschi". Nearby many possibilities to relax and spend moments of true and healthy fun! Amusement park 'Cavallino Matto' - DONORATICO 20 'away. We stayed at Casale al Pino for the 7th time and I think that says it all. We enjoyed our stays everytime and Veronika & Fabrizio are lovely hosts. 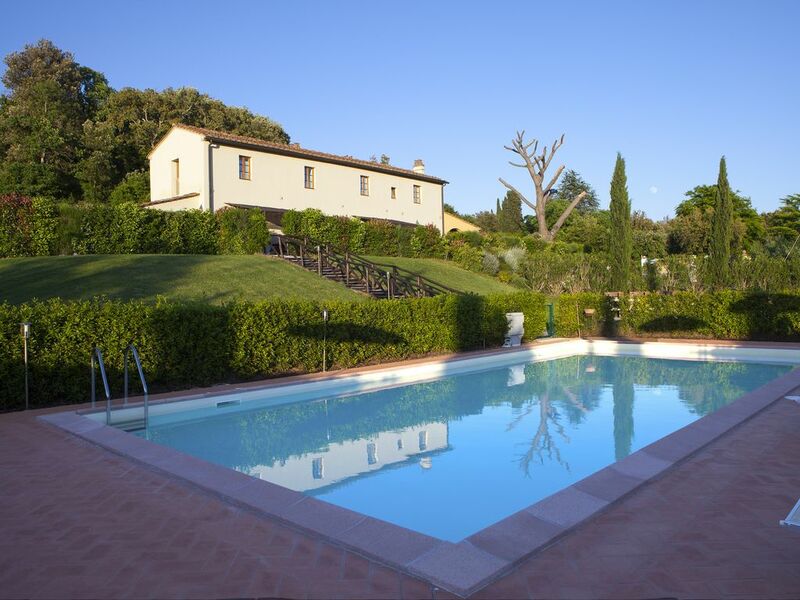 For us, it is the perfect Location in Tuscany and we can only recommend it. Take the exit for "Cecina Centro" at the roundabout follow signs for Volterra. Still about 6 km, always straight. Past the railway line on the first round always follow to Volterra, at the second roundabout take the second exit for San Martino NOT turn right to Volterra, turn immediately left and after about 300 meters on your left you will find our holiday home "Casale al Pino ". amusement park 'Cavallino Matto' - DONORATICO. The main cultural centers of Tuscany (Pisa, Florence, Siena, Lucca) are reachable in the day and we are surrounded by countless medieval villages and areas of archaeological interest. The number of restaurants and taverns in the area can delight all palates and oenology lovers can visit wine cellars and taste the excellent wines D. O.C. products along the renowned Wine Road.